← Why do women carry things on their heads? As we continue to gather evidence of women’s everyday work activities from English court records from the period 1500-1700, one of our aims is therefore to interrogate the applicability of the term ‘domestic’ to women’s work. Our preliminary results suggest significant limitations to all three applications of the term outlined above. ‘Domestic duties’ do not loom large in our database so far. Of the first 1000 work activities we recorded, the largest category of women’s work activities was ‘commerce’, accounting for 22%. ‘Housework’ – including cooking, cleaning and washing – made up just 10% of the total. ‘Childcare’ accounted for just 1.2%. It may be the case that these activities are under-represented in our sources – that people were less likely to witness a crime whilst undertaking work within their home – but as we will see in a moment we do not have any shortage of evidence of people working at home, just a shortage of them doing these types of tasks. What evidence we do have is suggestive of why this may be the case, especially in relation to cooking. Our Quarter Sessions material is full of court cases about stolen sheep, and these commonly involve searches of the houses of people suspected of stealing them. What the searchers often report finding is a pot boiling over the fire – usually with suspicious hunks of mutton simmering away in them – but very rarely do they report that such pots were being closely attended. What emerges is an impression that cooking was not in itself a particularly time-intensive task in English rural households at this time; instead, people bunged their food in a pot or set it roasting over a fire and got on with doing other activities. A particularly good example comes from a 1690s bastardy examination in the Wiltshire courts, where the mother identified the father of her child as a male servant who had ‘carnal knowledge’ of her in master’s kitchen ‘whilst neat’s tongues were boiling over the fire’. As her testimony shows, cooking was not an exclusive time-use activity. The same may also be true of childcare: one possible explanation for its under-enumeration in our study is that childcare was almost always done in combination with something else (this raises an issue that comes up often in modern time-use studies too – how to deal with simultaneous activities?). What is interesting nonetheless is that people very rarely considered it their primary activity in the depositions they gave. It may also be the case that we are dealing with quite different attitudes towards childcare in the early modern period: we have various examples of witnesses deposing that they had left young children at home on their own whilst about their business. The notion that children needed to be attended at all times may be an anachronism here, and this might go some way to explaining why it doesn’t appear as often in the records as we would expect. Another area in which we need to guard against anachronism relates to notions of ‘housework’. 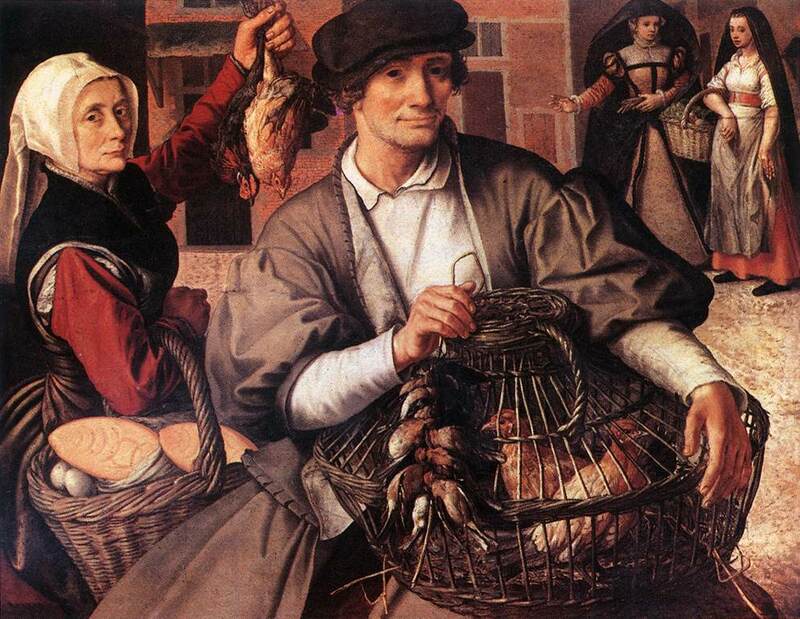 It is worth noting that early modern commentators tend to talk about women’s work in terms of ‘housewifery’, which is a more capacious term than our modern notion of ‘housework’ and is commonly understood as including food processing, textile production, milking, healthcare, education, and the gathering of water and fuel necessary for the household, as well as cooking, cleaning and childcare. If we add all these categories of tasks together we get a much higher proportion of 56.3% of women’s work activities so far recorded, though many of the tasks thus included are not what we would intuitively label as ‘domestic’ today, and nor do they necessarily fit with the other two definitions of ‘domestic’ outlined above, and that we will now turn to. 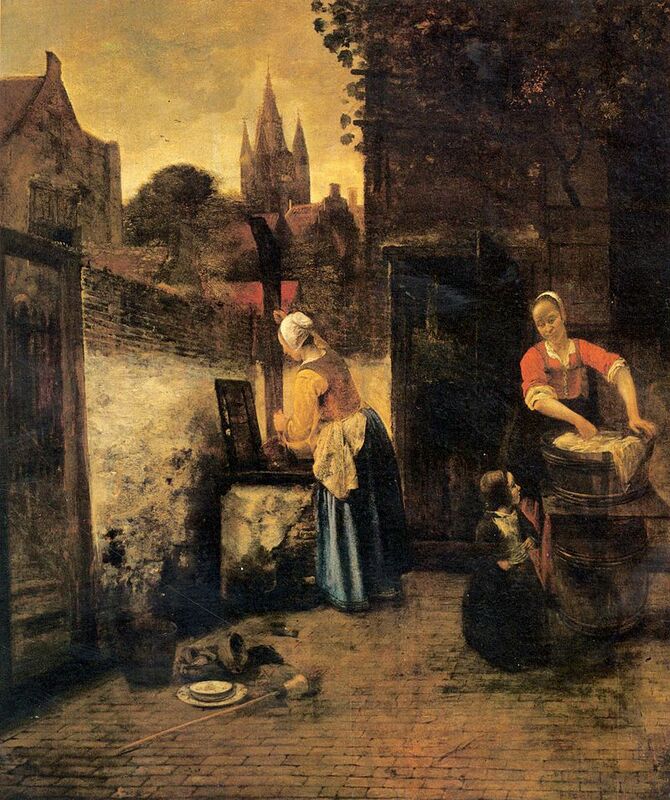 Was women’s work ‘domestic’ in the sense that it took place within the home? Where the information is given in our records we record the location of a work activity, so we are also in a position to offer an answer to this question. These results are still a work in progress so we don’t want to divulge them in full, but here are some suggestive highlights: ‘Houses’ do emerge as the most common location of women’s work activities so far, accounting for 27.4% of our sample. But it is notable that this is about the same size as the category of shops and markets, which accounts for 25%. Moreover, not all of those work activities that took place in houses can be counted as ‘domestic’ work: only 53.8% took place in the actor’s ‘own house’; 20% took place in the house of a master/mistress or kinsperson; and another 26.2% took place in ‘another’s house’. So, even if a quarter of women’s work activities took place within a house, not all of those were tasks that confined them to their own home. Indeed, another 21.8% of women’s work activities took place in outdoor ‘grounds’ of various sorts, ranging from gardens and fields to forests and moors. Whilst some of these might be considered domestic spaces, others clearly were not, and as many as 46.4% of women’s activities undertaken in ‘grounds’ were done so in the grounds of ‘other’s’, and only 25% in their ‘own grounds’. It is also likely that those work activities undertaken in the houses and grounds of others were forms of paid work of some kind, which brings us to the question of the market-orientation of women’s work. This question is complicated by the fact that it is very difficult to draw a neat boundary between ‘subsistence’ and ‘market-oriented’ work undertaken within early modern rural households. If a family grow and harvest a crop of barley and use some of it to make beer and bread which they consume, but sell another part of that barley at market, was the ploughing, sowing, reaping, threshing that went into its production subsistence or market oriented? The importance of these blurred boundaries becomes heightened when we consider the prevalence of buying and selling among the work activities we have recorded (‘buying’ and ‘selling’ together account for 20% of all of our work activities). Most of these transactions were not carried out by professional or large scale retailers, but members of modest farming households selling a surplus bushel of wheat at market, or one or two sheep to a neighbour. This suggests that even small peasant farms in our period had a high level of interaction with the market, so it becomes very difficult to label households – and the work done within them – as either subsistence or market oriented. Another way in which we might think more productively about the ‘market-orientation’ of women’s work is by thinking about work activities that were undertaken explicitly ‘for another’ outside of their own household unit. Again, where the information is provided in our sources this is something that we record, and we have some suggestive preliminary results here too. Of the first 450 work activities done by women that we recorded, 25% were tasks done ‘for another’ to whom they had no familial or kinship ties, and for which we might reasonably assume they were paid. And that is a minimum estimate, as the other 75% were not necessarily unpaid tasks or those done for the benefit of their own household – most of those 75% do not specify who the work was for, and some that do are for siblings, wider kin, or parents, which could be paid work in some cases. So, an estimate that a quarter of our activities done by women were for pay is a low estimate: and even so that’s quite a high proportion if we start with the assumption that women’s work was overwhelmingly subsistence-oriented. That said, I should probably say that I have included service here, which was, after all, paid work, even though it is often labelled ‘domestic’. But even if you wanted to exclude service from this calculation the total figure would still be a minimum of 16.2% of tasks done by women for pay. This is, necessarily, only a rough outline sketch of an argument – we are still gathering data and need to subject our results to more thorough and prolonged analysis before we present it in full. Nonetheless, we wanted to give it an airing as we continue to develop it, and would welcome any comments and feedback. What our findings suggest so far is that the term ‘domestic’ has serious limitations as an adjective for women’s work in early modern rural England. Whether in terms of the range of tasks women engaged in, the locations in which they did so, or the market-orientation of their work, our evidence points towards a significant proportion of women’s work activity that does not fit comfortably under the heading of ‘domestic’ work. 16 Responses to How ‘domestic’ was women’s work? Thanks for a really interesting post! This has some major implications for the work I’m doing on the development of agrarian capitalism which straddles the second-half of your period. The nature of my project involves inferring ‘capitalist intent’ or market orientation of farmers and farming households from proxy measures such as whether a farmer paid a market rent, employed wage labourers, or simply had a large-scale farming enterprise. Clearly there are lots of issues in drawing such inferences (a large part of what I’m doing is exploring these problems) but I think your post shows that I need to be even more careful in my consideration of drawing distinctions between subsistence and market oriented production. Clearly modern usage of the term ‘domestic’ is anachronistic when applied to early modern England but I wondered if you had any ideas about whether there are any merits in retaining it (however carefully defined) or whether you had an idea for what it could be replaced with? The issues of definition and inconsistent use of the term domestic remind me of another contentious one – peasant. Whilst highlighting their limitations is extremely valuable, these terms are so intimately bound up with their own histories and intellectual baggage is it best to jettison them entirely, or is that just a cop-out? Thanks for your comments Josh. Whilst we are finding lots of evidence that small farms that would not usually meet the criteria of ‘capitalist’ were often engaged in market exchange, I’m not sure this is a major challenge to the sort of endeavour you are engaged in. It is important to be sensitive to the blurred boundary between ‘subsistence’ and ‘market-oriented’ agriculture, of course, but my sense is that in the economic history literature the issue is not one of identifying farms that are exclusively ‘subsistence’ or exclusively ‘capitalist’, but trying to establish the line where one mode dominates over the other on a given farm. As for retaining the term ‘domestic’, I don’t think we really have a problem with it as long as it is being used in a clearly defined sense (which it often isn’t). And it would be reasonable to say that women did do a lot of work that could be defined as ‘domestic’ in accordance with the one or more of the three senses I have outlined. The issue for us is that women’s work is so often described as ‘primarily domestic’ which misrepresents the range and nature of work that women did. That said, we do think that the term ‘housewifery’ is a useful one, and captures some of this range more effectively than the terms ‘domestic’ and ‘housework’ which do tend to invoke a narrower range of work activities. Mark, this is really fascinating work; if these are preliminary results we have much to look forward to. I’m just curious how you choose to define these categories – are they taken from secondary literature, historical conceptions of labour, or elsewhere? Apologies if you’ve posted it elsewhere and I’ve missed it, but this seems like a crucial aspect of the project more generally. Thanks for this Heather. Do you mean how we have chosen to define ‘domestic’? If so, these are the definitions most commonly used in secondary literature on women’s work (Jane is working on an article which will discuss this in more detail). Thanks Mark. I will look forward to reading both of these, then. As you think about how to present categorization and interpretation—and the way those are almost inextricably intertwined—I encourage you to look at the work George Oates (http://goodformandspectacle.com) is doing and, ideally, meet with her for a conversation about your project. This challenge is something with which she’s wrestled; I know she’d be a huge help in finding paths through the maze. Also, she’s enormous fun and great at setting all the creative parts of my brain sparking. Cakes and/or ale with George is invariably a boon to my thinking. Thanks for the suggestion Dinah, we’ll bear that in mind. A lot of these issues in understanding women’s ‘domestic’ work came up in my study of the account book of Richard Latham c.1723-1767. He was a Lancashire husbandman whose 6 daughters were involved in flax processing and washing both for subsistence and for the market. I calculated the economic benefits of domestic linen production for domestic use and considered how their flax spinning and washing varied over the life cycle. 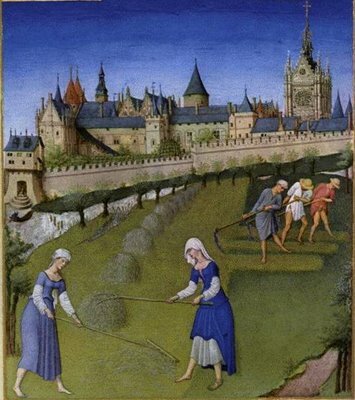 (They started growing their own flax when prices rose dramatically). To be fair, the linen element is less directly applicable to your period because we don’t really know how common it was for people to manufacture their own linen in the period. But because it’s a different type of work & time study I was able to interrogate these questions in greater detail – so it might be of interest? If it is then I’m happy to send you a copy of the thesis chapter (I developed on the economic issues in this rather than the article). On the other hand, it’s slightly embarassing plugging my own work about this and I won’t be offended if it’s not of interest given the different century. Thanks for this Alice – please do send along a copy of the chapter, that would be great. The PhD student on our project – Imogene Dudley – is actually looking at household accounts, to provide a point of comparison for the material we are producing from the depositions, and although Latham is a bit later it would be a really useful example to help her think about how to use her accounts – and for us to think about the boundary between subsistence and the market in the textile industries we do have material on. Hi Mark, great to see your post – I had rather similar concerns about fuzziness of terms in relation to ‘self-help’ when working on my thesis on 17c household medicine (copy in the Devon and Exeter Institution or email me). I looked at household accounts alongside other family papers and it was so apparent that the nature of self-help healthcare was not clearcut, many health tasks were completed by women but the standing of their work was rarely clarified in payments (unlike male physicians, surgeons. apothecaries that were usually identified by both name and role). Ian Mortimer completed an excellent study in which he used probate accounts to pin down the additional healthcare services in households with and without female kin – though I wonder if the focus of such accounts around terminal illnesses might have skewed findings towards services of medical practitioners. Drawing on the household accounts I also found that more purchasing of remedies was going on than general assumptions about self-help healthcare and household recipes would suggest (Jane Whittle already noted this kind of expenditure in her work on Alice LeStrange). Several further things spring to mind – firstly that I gained much helpful insight from some work done on housework categories in an earlier period by Montserrat Cabré (Cabré, Montserrat. “Women or Healers? Household Practices and the Categories of Health Care in Late Medieval Iberia.” Bulletin of the History of Medicine 82 (2008): 18-51). Secondly, in relation to healthcare, there is a question for me about the boundaries of domestic space, since the kitchen (and stillroom etc) are readily perceived as domestic but what of the garden and foraging space beyond (hedgerow, meadow, woodland), which could provide key resources such as medicinal ingredients. I think the boundaries need to be considered somewhat permeable, and this could be affected by gender and status … whether this sort of consideration is something exclusive to health or not, I hope your work will help further illuminate the question of domestic space! Thanks for your helpful comments Anne. There are lots of overlapping issues here with our project, not least relating to the challenges of identifying forms of unpaid women’s work. We are having some of these conversations with Jonathan Barry’s Medical Practitioners project here at Exeter – and should be in a position to pass along to them our evidence of women’s healthcare work. Your point about the boundaries of domestic space is a really good one too – especially in relation to outdoor ‘domestic’ spaces – and is something we will need to think about further in our analysis of locations data.